Juicy Development has released an update to Police Scanner 2, its emergency radio streaming app that lets you listen to police, fire, and EMS activities around the world. Version 2.2 ads iOS 4 capabilities like background streaming and high-resolution image capability. Police Scanner 2 lets you stream from more than 2,300 live national and international EMS streams. It harnesses the iPhone's GPS function to help you find streams near your location, letting you stay on top of emergency reports in your area. You can also share streams with friends via Facebook or Twitter, and submit local alerts that show up under the listing for that area. As more cities provide compatible EMS streams, the Police Scanner 2 database is automatically updated, with the stream added instantly. 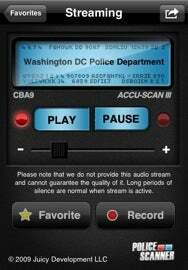 This latest update brings Police Scanner 2 in line with other iOS 4-optimized apps, letting you listen to your live stream while accessing other apps and displaying high resolution images on the iPhone 4's Retina Display. Police Scanner 2 sells for $5 and is compatible with iPhone or iPod touch running iOS 3.1 or later.